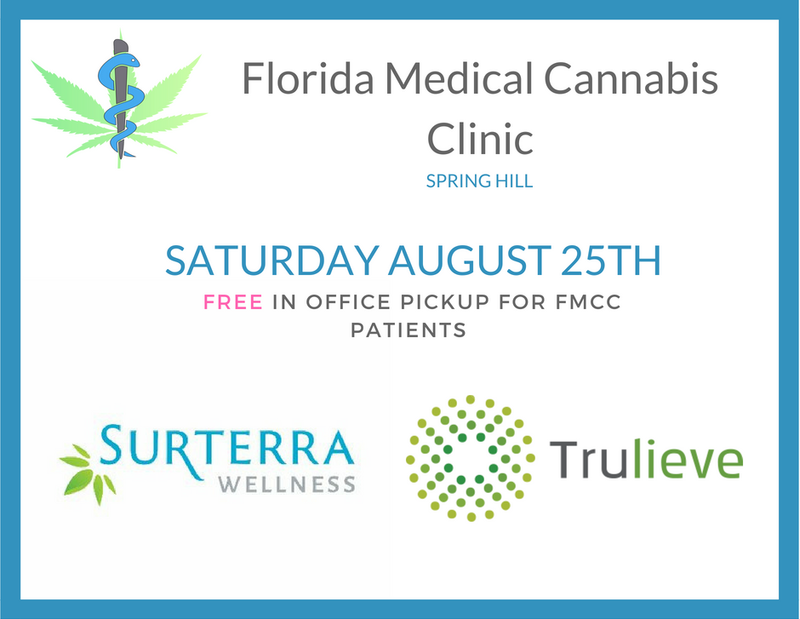 Exclusive for Florida Medical Cannabis patients Surterra Wellness & Trulieve will be offering FREE in office pickups on Saturday August 25th. Have your Patient ID# ready. It can be found on your patient ID card, in the online registry, and on the paperwork provided to you at your initial appointment with us. Call Surterra or Trulieve to place your order (contact info below). Their staff will walk you through the ordering process and answer any questions you have about products. Mention you would like to take advantage of Dr. Gebhardt's free in office (Spring Hill) delivery on August 25th. Our address is 1377 Deltona Blvd Spring Hill FL 34606. MMTC staff will schedule a time for you to pick up your order (will be sometime within 10AM-1PM). Trulieve orders may be placed online under the delivery option (with our address as the location). It will show a $25 delivery charge. Your discount will be applied at the time of pickup. Mention it's an office delivery when they call to confirm. Join our physician Dr. Scott Gebhardt DO and our Cannabis Health Coach Kristina Risola, CHWC for a free medical cannabis education event for Caliente Resort Members and Hotel Guests. Attending saves over $50 on your New Patient Certification Exam! PLEASE SHARE WITH AND BRING A FRIEND! 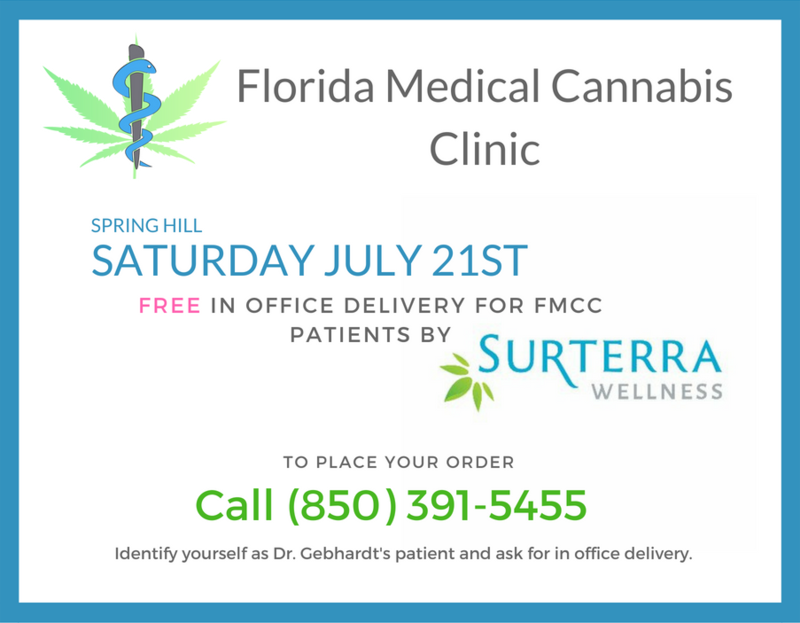 Exclusive for Florida Medical Cannabis patients Surterra Wellness will be offering free in office pickups on July 21st. Call them today to place your order! You will be given an appointment time to meet with a Surterra Wellness Mobile Coordinator. They will provide your with your order and answer any questions you may have. Join our physician Dr. Scott Gebhardt DO and our Director & Cannabis Health Coach Kristina Risola CHWC for a free medical cannabis compassionate use awareness event! Seating is limited. 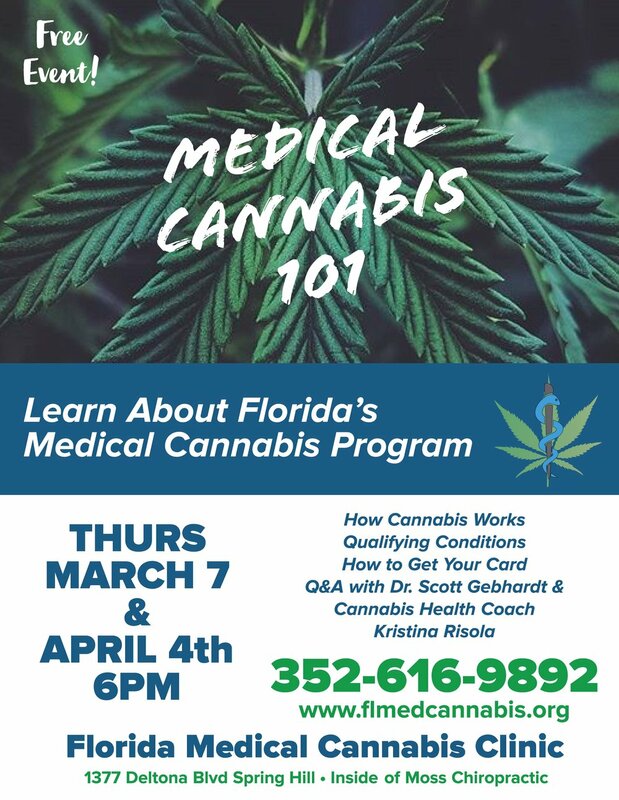 Please RSVP to this event, call our office at 352-616-9892, or email info@flmedcannabis.org to reserve your seat. Medical Cannabis 101: Free Seminar! Join our physician Dr. Scott Gebhardt DO and our Director & Cannabis Health Coach Kristina Risola CHWC for a free medical cannabis education event! Join our Director & Cannabis Health Coach, Kristina Risola for a free talk at Wright's Natural Market in New Port Richey. She'll take you beyond the typical health behaviors to learn how following your intuition, leaning into the moment, and living intentionally will help you to live a more balanced and authentic life.